You know what's better than a deal? A triple deal. Amazon's Gold Box offers for today are all about SanDisk memory and in there are three nice deals for those of us with Android phones. First is the Ultra 256GB MicroSDXC UHS-I card with adapter. While this isn't the new fancy U3 card, it's still plenty fast with transfer speeds up to 95MB/s. Last we saw it, it was down from $200 to $135 on Amazon, but it had once reached $120 at B&H in limited quantities. Now it's back again at that same price of $119.99 on Amazon, which is its cheapest at the retailer according to CamelCamelCamel. Second is the Ultra 128GB MicroSDXC UHS-I card, also with adapter. This one is a lot cheaper than the 256GB, at nearly a quarter of the price, giving it one of the best price-per-value ratios for MicroSD storage in SanDisk's lineup. It's down to $32.99, which isn't its absolute cheapest price ever (that was $29.99 last Thanksgiving, says CamelCamelCamel), but it's still a nice discount from its current price of $42.95. And finally, there's the 128GB dual USB and USB-C drive, which can be very useful for transferring media and data from your computer to your phone, or between phones. It usually goes for about $59.99, but it was down to around $40 last Thanksgiving. Now, however, it has dropped a little further to $38.89. That's the lowest it has ever reached, and a lot of removable storage for a decent price. If you're interested, the Gold Box deals last today only (19 hours remaining as of the time of writing) and shipping is free for Prime members. 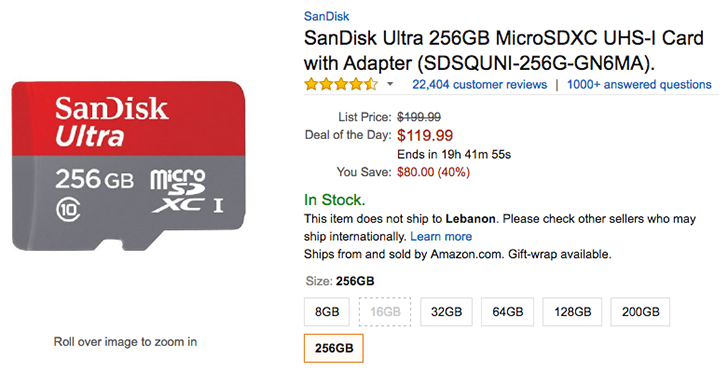 All the links are below along with the general Amazon Gold Box page if you want to see the other SanDisk deals for today.